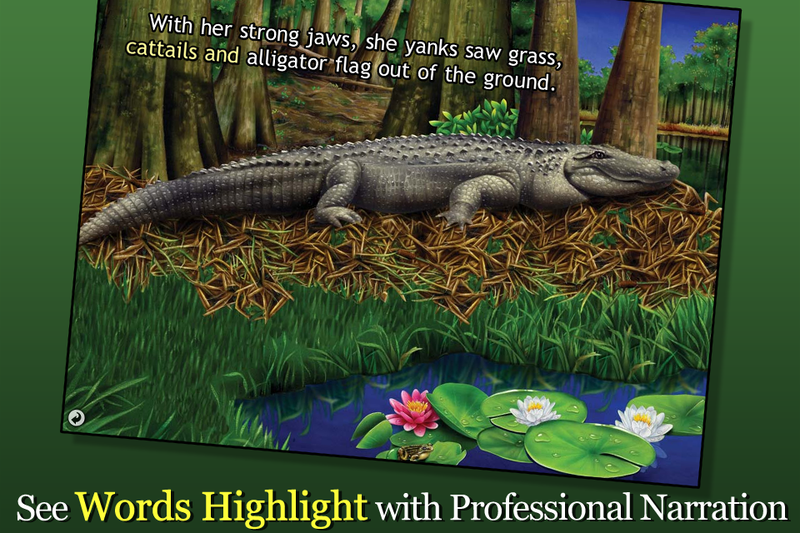 Alligator at Saw Grass Road is a lovely little title from Oceanhouse Media's Smithsonian Collection - a series based on popular non-fiction print titles about the natural world. The print version of this title was released in 2011 along with an audio CD, revising an older Soundprints title from 2006. As an OMbook published for mobile devices in 2012, this title sparkles, giving enormous value over its print counterpart, including narrated text that highlights as read. This book series fills a great need for digital book apps with non-fiction educational content. The books selected so far have been well vetted as print titles, making it easy as parents & educators to select these digital books with confidence. This title covers the lives of alligators, their babies hatching, hunting and even the turtles that hide their eggs in the alligator's nest. Each title in this series takes the original print images and pans over them in a nice, semi-animated style. There is also a nice array of sound effects, like spashing in the marsh, bird sounds and , paired nicely with a great male voice-over. The sound effects also help the story come alive without overshadowing the narration. Overall, this is a solidly made book with nice enhancements. If you tap anywhere on the page, words appear that represent the different images (e.g. 'alligator', 'turtle', 'egg'). If that word also happens to be part of that page's text, the word is highlighted within the text of the story, helping young readers make important connections between the written and spoken word. Paired with OceanhouseMedia's omBook's template, non-fiction titles get a clear educational boost when print goes digital. The only things I would suggest for improvements would be a page guide and a way to turn the sound off for the interactive elements (words) in the 'read myself' setting. Links outside the app are also present, although they are at least tucked away in settings found only on the title page. As a way to foster a child's love of the natural world this app series gets high marks. It is well developed and based on sound scientific information. There are even a few pages at the end with extra educational content about alligators. These books are also beautifully presented with nice illustrations and light enhancements that make the print titles come alive. Recommended! In the Florida Everglades an alligator prepares her nest and makes it out of saw grass. She makes it 3 feet tall, so it can stay above the water during the summer rains in the marshy environment. Then she lays her eggs ... 3 large white eggs with hard shells. She keeps the eggs safe and sustains herself from the very lush environment of the marsh. The alligator must stay close to her nest to protect it from predators, like raccoons. A turtle even drops her own eggs into the mix, confusing the alligator into protecting the whole nest. When the the eggs are ready to hatch, in mid-August the alligator helps them get out of their hard shells. The turles also hatch and sneak out into the water when the alligator leaves. The alligator babies are raised by their mother, though, encouraged to follow her by a series of grunts. Soon the babies are hunting on their own, learning about their environment and growing up to be on their own.